When the developer set to level a row of restaurants and businesses on Broadway found a way for the farmers market to stick around one more year, you had to wonder how much longer the other businesses on the block would get to stay. Cafe Septieme isn’t waiting around to find out. With the planned redevelopment set to level the block of buildings the restaurant has called home since moving to Capitol Hill from Belltown in the early 90s, Septieme is telling its patrons goodbye and thank you. 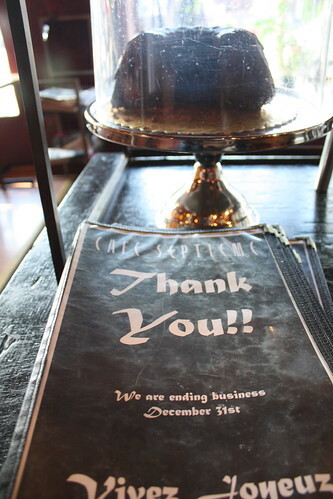 The last day for the restaurant is December 31 according to the message added to the front of Septieme’s menus. We haven’t had a chance to speak with Septieme owner Victor Santiago about his decision but we did talk to one employee who said he has worked at Septieme for more than 10 years and is now facing a search for a new job. We’ll also follow up with the firm behind the project that will demolish — and re-build — the block, SRM Development. You can read more about their project in this CHS write-up about the development. Thanks to CHS neighbor Olivia for bringing the menu-based announcement to our attention. Empty spaces, less jobs, changes galore. Light rail and redev. are changing the Hill a lot. Too much for most of us. I had dinner there about once a month, nice place, good service, food was often excellent but not always …. Will miss the joint, which was down town at an even earlier incarnation. What was with the name, which means 7th in French?? seventh arrondissement, or district, in paris. la tour eiffel, hotel des invalides, etc. c’est ca. It is French for Andy’s Restaurant, a diner it replaced there. :) Their lamb curry over rice, with mashed potatoes on the side, was to die for. between Septieme closing and Bailey/Coy, I really don’t have much incentive to visit B’way…Auf wiedersehn, delicious Schweinschnitzel and the divine Rodney. …but I will not miss this place in the slightest. Terrible food, poor ambiance. Picture this: 1995- Septieme is where I took my mother to have lunch when I finally decided to tell her I was gay. I go to Septieme at least once a week between my classes for the early bird breakfast special…the guys who work there are so kind to everyone and I will really miss them. I’m really sorry to hear this. Septieme has been an excellent place to get a reasonably-priced meal for a long time, and the ambience was very comfortable. The menu choices were very creative, and the food usually good to very good, especially for the prices. There are many restaurants in Seattle where you can get an excellent $50 (and up!) dinner, but very few like Septieme…it occupied a niche between fast food and “finer dining,” and will be missed by many. Is there any possibility it will re-emerge as a tenant in the new development? (he says, hopefully). What the heck is happening to Broadway? All this leveling and redevelopment is killing the community. This is the first I have heard that the block Septieme is on was being redeveloped. Capitol Hill is losing a lot of its quirkiness, and is fast losing its uniqueness and heart that made it the gay mecca it once was when I moved here 13 years ago. The owner also owns La Cocina and Cantina on Broadway and one of the servers there told me that Septium hasn’t been making any money since June and if it weren’t for La Cocina paying the payroll it would have been closed months ago. The owner of the building asked for him to stay til December 31st so the space wouldn’t go empty. If you like Victor support him by going to La Cocina I know I will! I refuse to support the man who has steadily run Septieme into the ground over the last few years (remember the fiasco over ImmigrantGate when he fired the staffers who wanted to go to the Immigrant rally?) But I will support the great people who work there. Note to Alex: No, the food was frequently very good…it was also occasionally, quite terrible. The kitchen WAS uneven. 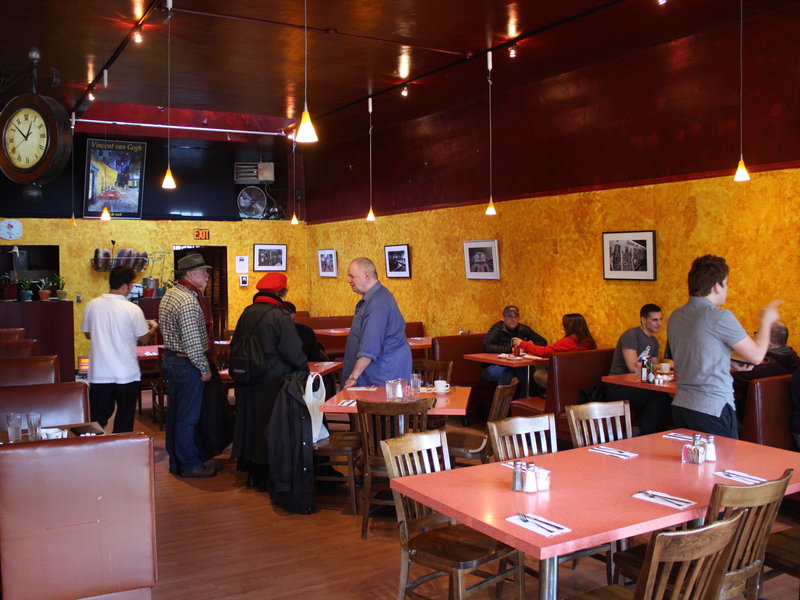 In the mid-90s I had at least a weekly breakfast date with a friend when Septieme was in belltown… and then 3-4x a week in its current location. I even stole one of their signature cafe au lait bowls for a friend who was away in the military for several years so he would feel “at home” (for the record, Septieme would not let me buy it from them, and I left a big tip). I know that it hasn’t been the same since it changed hands a few years ago but there are still so many beautiful memories there… Thank you for honoring it CHS. I won’t miss Septieme. The owner is an anti-immigrant douchebag (he fired the restaurant’s manager in 2006 for allowing his latino staff to take the day off to march for immigrant rights). Good riddance!